Since I'm moving the shop, I have teamed up with a good friend and expert, Jens Erik Olesen, who is also carving pipes as a hobby. End October he is opening a wine and pipe store here in Fåborg, - two things I think go well together, and he is very dedicated. At the same time he's planning on starting a pipe club covering the southern Funen area, so anybody interested should give him a "push". 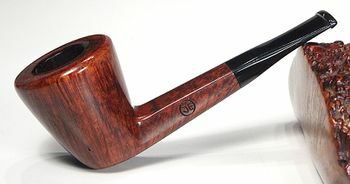 So apparently Jens, at least at that point in his pipemaking career, was coming at it more as a hobby than a profession. Perhaps once he opened his "wine and pipe shop" and started sharing workshop space with Viggo, Erik's pipemaking became more of an avocation. 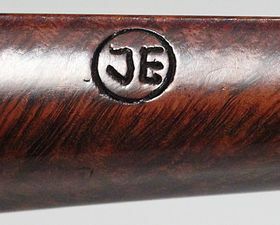 If you have additional information about Jens Erik or his pipes, please add it here, or send it to sethile.pipes@gmail.com and we can add it for you. This page was last edited on 22 February 2019, at 09:45.